There are currently approximately 7,000 “lone soldiers” serving in the Israel Defense Force (IDF). Some of them are new immigrants to Israel that arrived without their families in order to serve in the army, and some of them are Israel-born soldiers from difficult socio-economic backgrounds. For at-risk soldiers, army service is a second chance to succeed in life, and to break out of the circle of poverty. For new immigrants, army service is a chance to join the full ranks of Israeli society. The Beit Kobi organization was established in honor and memory of Kobi Ichelbom, who fell in action on March 10, 2002. Kobi was an outstanding combat soldier and commander in the Givati Brigade, one of the elite fighting units in the IDF. Familiarity, friendship, love of the country and the IDF code of ethics were guiding principles for Kobi; according to these principles he educated his soldiers. 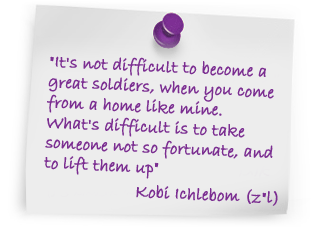 “It’s not extraordinary to become a good soldier from a home like mine”, said Staff Sergeant Kobi Ichelbom (HYD), "what's important is to take someone having a difficult time and to lift him up". Following his words, Aviva Ichelbom, Kobi's mother, and her family, established Beit Kobi as fulfillment of his unwritten will. Beit Kobi is a unique community model, which takes care of all the needs of lone soldiers, taking part in the soldiers' lives and meaningful elements of their lives, and is the only civilian organization that is legally authorized by the IDF to assist lone soldiers and to run values-oriented workshops for their commanders. Beit Kobi was established and operates in memory and honor of Staff Sergeant Kobi Ichelbom (HYD), according to the values which were his guiding principles by which he educated his soldiers. We wish to be an organization, unique and inspiring in its activity. Therefore, Beit Kobi works hard to help the physical, mental, and moral well being of Israel's soldiers and Israeli society in general. We do this by promoting the values which were a guiding principle for Kobi: Familiarity, friendship, love of the country and the IDF code of ethics.